This week the snow and ice returned, leading to winter activities such as huddling indoors, clinging to radiators and wearing hats. A further incentive to stay in was provided by the arrival of a new book: “What Painting Is” by James Elkins, bought with birthday money and full of strange (but true) ideas about painters and their peculiar obsession with moving smeary stuff around on flat things. It is quite odd admitting to yourself that you have a fascination with smearing colourful greases about on pieces of material, and thinking that you could probably continue to find it incredibly engaging and interesting throughout life. Yet it isn’t really any stranger than other people’s passions (I hope). This week’s work seems to have taken hours yet not much change to show for it – but painting always seems to be one step forward two steps back (and then sometimes a big jump forward and you never know why). In his book, Elkins compares painting with alchemy, that weird mystical field that preceded science. I’m not so interested in that but more interested in the way he describes just how famous painters (Monet, Pollock and Rembrandt so far) put their paint on the canvas. For instance, Elkins is convinced that Monet stabbed at the canvas quite violently with his brush, which makes you think again when considering his peaceful, sun-dappled scenes of hay meadows and water gardens. I have read somewhere else that Monet said he painted slowly rather than fast, so who knows? 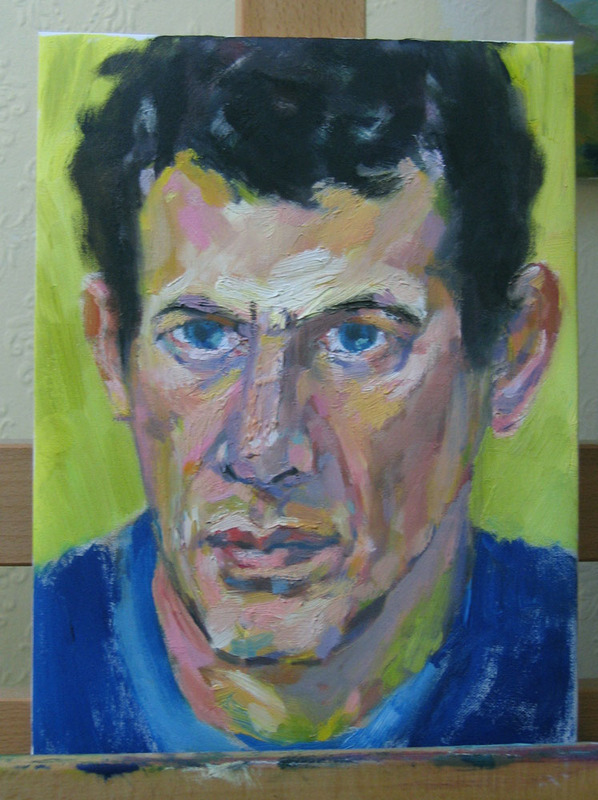 I suppose he could have attacked the canvas determinedly with each stroke but taken his time between strokes as well. Elkins also reckons that Pollock went to great pains to ensure his paint hit the picture surface in just the right way every time, so that anything that too closely resembled a recognisable shape (like a figure) was destroyed. The book points out the huge variety of different movements that Pollock must have made to create his abstract marks and, although I don’t get excited about his painting, I can appreciate that it works and that it was probably extremely difficult to get right. It is really hard to make brushmarks that appear both random and pleasing at the same time. 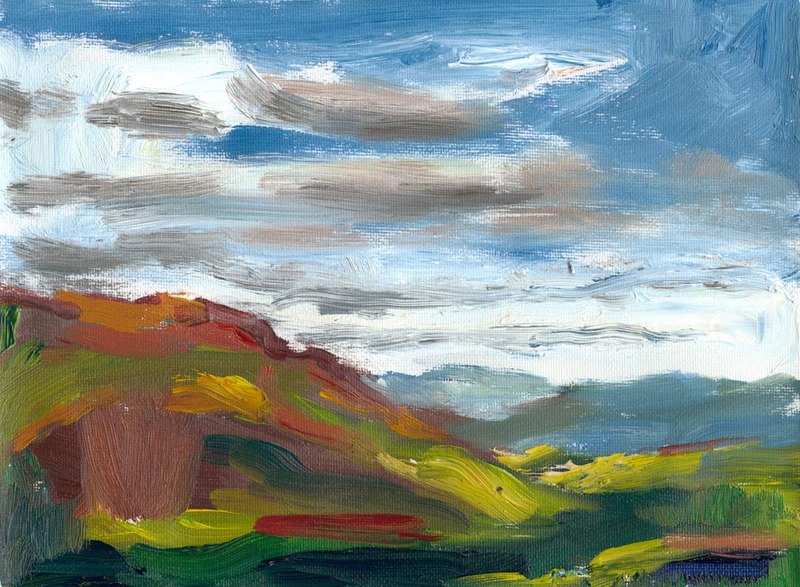 Having copied a couple of Nolde’s paintings and stared at many other pictures created by painters who can do ‘wild and free’ strokes, I can see that it is a process of being able to let go just enough but not too much. If you let go too much you can’t depict what you’re trying to but if you are too careful, trying to make sure your picture looks like it ‘should’, the brushmarks soon begin to look a bit leaden and all the same. Working quickly helps. Sometimes painting out of doors, with the clouds whizzing by and the light altering by the second, means that brush hits canvas in a blur and, before you know it, a wonderful sea of lively marks has appeared. If you are lucky and have been practising a lot the painting works but, if not, you run the risk of ending up with a mess that doesn’t really look like anything – although the brushstrokes are nice. This entry was posted in paintings, plein air, thoughts about painting, winter and tagged alchemy and painting, claude monet, how great painters approached their work, jackson pollock, james elkins, mark making when painting, painting obsession, what painting is on January 31, 2015 by fellpainter. This post’s title was stolen from Mervyn Peake’s poem in his book “Rhymes Without Reason”. The poem is about feeling ill but the lines could describe the back and forth of the painting process just as well. Mervyn Peake was a brilliant artist as well as a poet and novelist. I often read “Rhymes Without Reason” as a child and I can still see the strange, brightly-coloured illustration that accompanied the waxing and waning poem, showing an enormous lady with large nostrils sitting in bed while a doctor surveyed her from the end of the room across a swirling carpet against a background of psychedelic wallpaper. The picture became etched in my brain, along with many of the other illustrations, and the brightly-lit, vaguely nightmarish room seemed real, as if the scene was taking place somewhere, in the night, in a nearby dimension. This week has consisted of plodding along with works in progress while the world outside becomes ever more frozen and slippery. 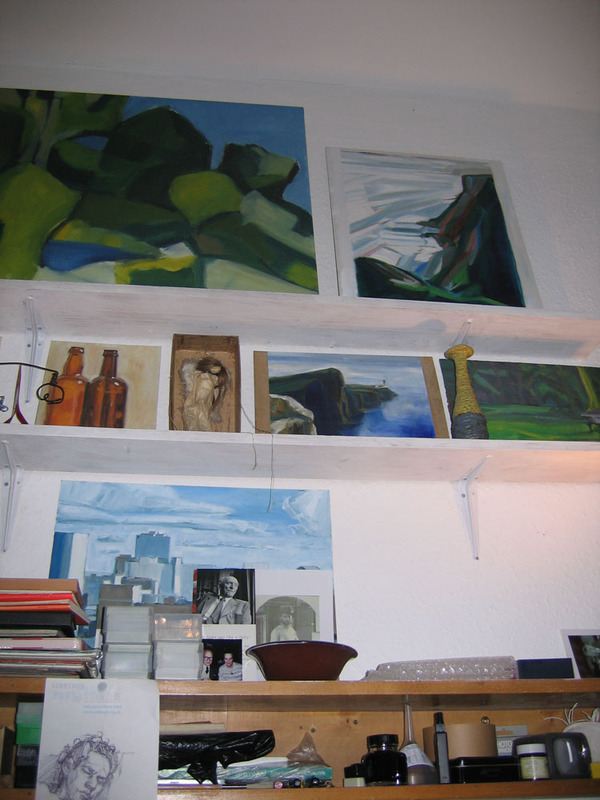 The sun is beginning to find its way into our home and has revealed that my studio space (which is so tiny I can only use it for painting small pictures – larger indoor work expands into the living room) needs some attention. Apart from lots of dust on high shelves which I can’t reach there are things which are obsolete and need removing. A wire loops across a wall leading to a non-existent speaker and the remains of past projects – a brush gaffered to the end of a garden cane, a set of three yogurt pots with watercolour blobs inside them – should probably be tidied away. Two paintings have been lurching along their paths towards completion. I am quite pleased with the Crosdale one seen at the top of the post. 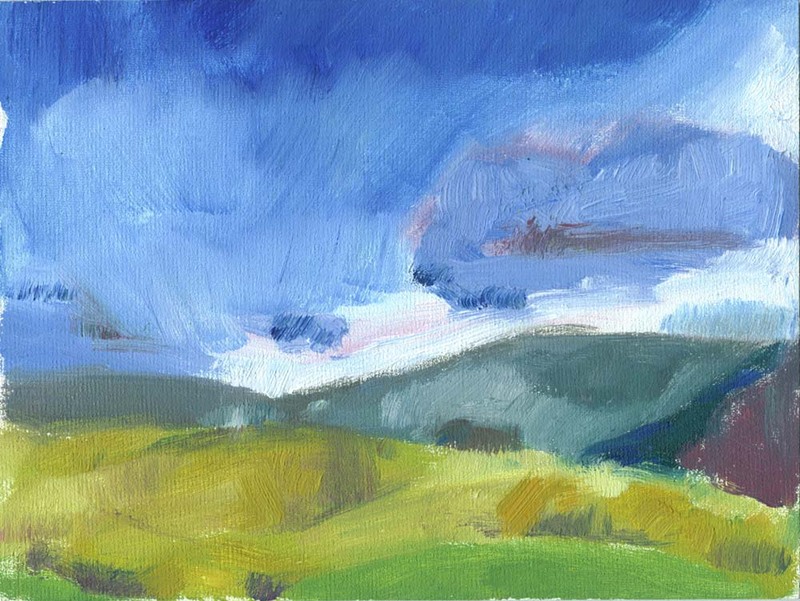 I find it difficult creating a bigger version of a small, quickly and freely painted plein air work so when it goes relatively well it is a boost to morale. 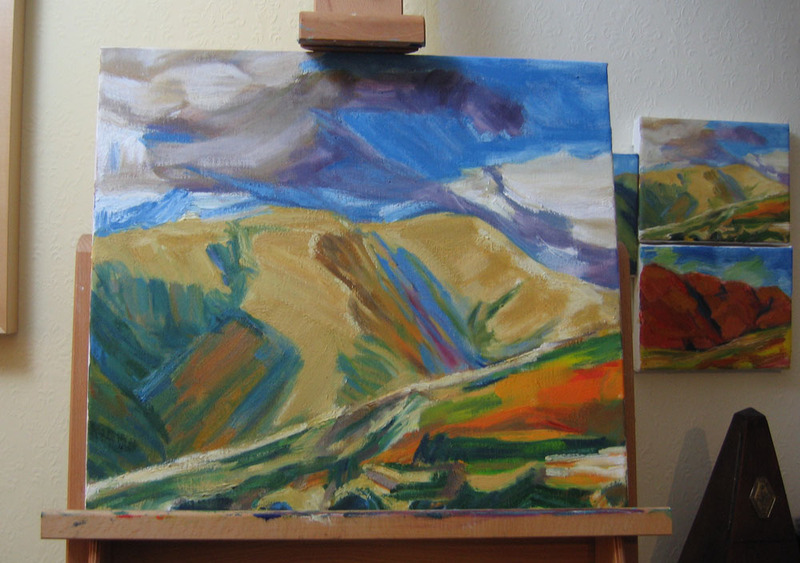 The Whitewell painting, which is being created based on a tiny drawing, has progressed in a darkwards fashion. Perhaps with Nolde’s failed experiments in mind, during which he produced ‘grey sludge’ I seem to be heading in the same direction. 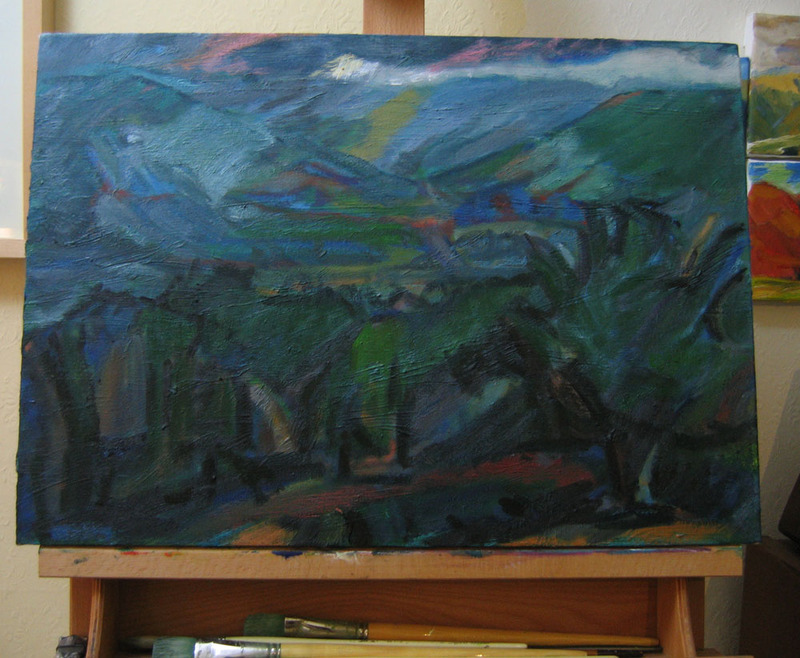 Still, all is not lost and I hope to be able to bring some light and colour into the picture as work goes on. If it all goes wrong I will have learnt something, even if that is not to begin a picture with a grey-green underpainting. 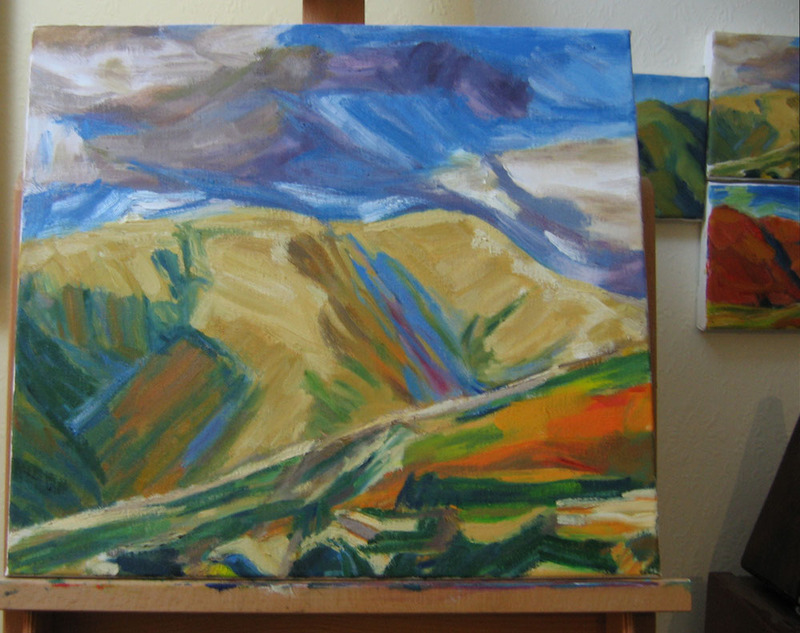 It has certainly made all the colours and tones do quite unexpected things compared with starting from a white canvas. 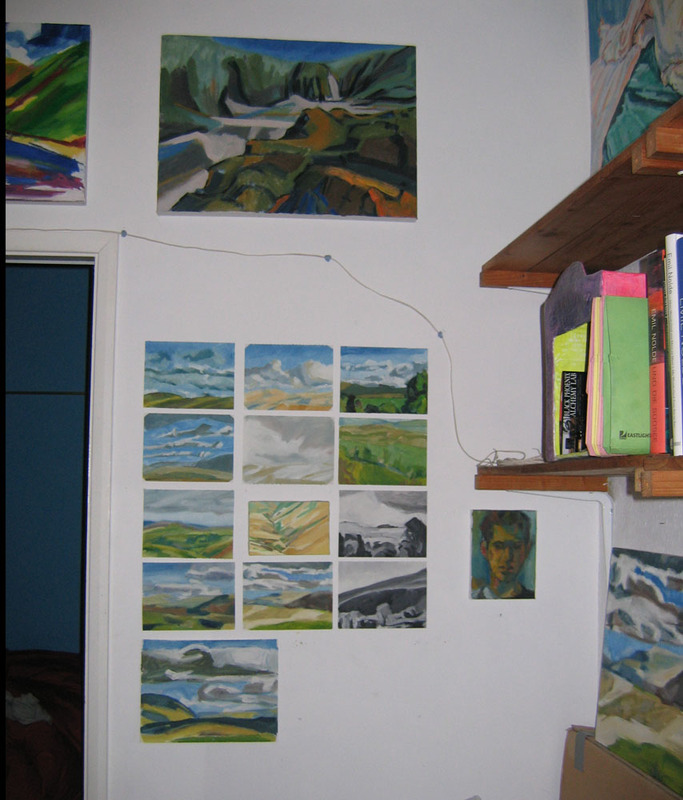 The array of paintings on my studio wall reminds me of a plan I had to create an elaborate mount to display around a dozen small glimpses of the landscape in one big frame. It seemed like a wonderful idea until the reality of carefully cutting all of those tiny openings in a huge piece of mountboard sank in … maybe not. 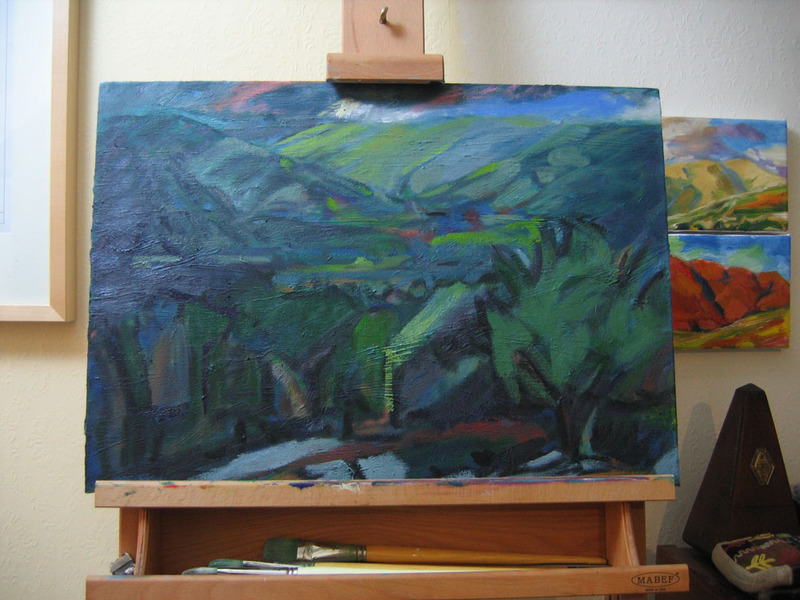 This entry was posted in paintings, studio, thoughts about painting and tagged dark paintings, ebb and flow, larger paintings from plein air sketches, Mervyn Peake, paintings from drawings, the painter's studio, the painting process, work in progress on January 21, 2015 by fellpainter.